Fall back to Standard Time - a once a year opportunity. This weekend, a unique opportunity awaits if you’ve been trying to create a habit of rising earlier. It’s time to “Fall Back” when Daylight Saving Time ends Sunday November 5 at 2am ET. Autumn officially arrives Friday September 22 at 10:02am ET/1:02pm PT, and darkness begins to dominate in the Northern Hemisphere. Acknowledging this shift, and choosing practices which align with nature's rhythms supports our overall health and well being. Tips To Lighten Up this Spring Part Two. Preparing healthy food for oneself is an act of self care. Eating more greens, just like moving your body in the morning, is a good year round practice, but especially important in Springtime. By eating nature’s local seasonal bounty, we take in what the earth produces in our ecosystem. Ensure there is GREEN in more of your meals. According to Ayurveda, the taste of greens is bitter, which helps us to clear out the excess waste (and excess weight) that's accumulated over the winter months. The bitter taste helps to balance the elements of earth and water, which have heavy, dense and cool qualities that predominate in early Spring. Eating more bitter greens retrains our palates from the Western Diet's predominant sweet and salty tastes. Try varieties of lettuce, spinach, kale, Swiss chard, collards, parsley and bok choy. Wild greens, including lamb’s quarters, dandelion greens and nettles are often at farmer’s markets, so express interest if you don't find them. Wild greens contain denser nutrients than cultivated greens. Spring vegetables include artichoke, asparagus, fennel, spring onions, green beans, snap peas and snow peas. Young greens first appear as sprouts and shoots, which contain a highly concentrated nutrient value. Sprouts can be added atop most any dish or even blended into smoothies. Start your day with an early Spring green smoothie for breakfast. 2-3 tablespoons of soaked chia or flax seeds. Hemp seeds can also be used but don't require soaking. Enjoy the smoothie at room temperature. Cold, icy drinks are difficult to digest. Take a few deep breaths before drinking, and savor your smoothie. Enjoy a large leafy green salad as a base for roasted vegetables at any meal. Make greens the mainstay when adding animal protein (preferably the best quality you can find). More often, farmer's markets are carrying ethically raised, sustainably sourced poultry and meat. 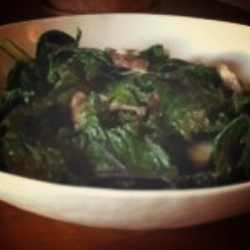 Simple sautéed leafy greens take just a few minutes to prepare. This is a basic blueprint, but add additional veggies or spices for variety. Heat 1-2 tablespoons of coconut oil, ghee or grass fed butter in a large sauté pan on medium heat. Sautée one cup chopped onions, shallots, or leeks for 5-7 minutes. Continue to sautée the greens in the onion/mushroom mixture. Add a few tablespoons of water, or bone broth, cover and steam several minutes. Have a simple green soup with dinner, using leafy greens as a base. Blend celery, fennel and avocado, and seasonings of your choice with vegetable broth, bone broth or water. Thai curry paste is an easy way to add more zing to your living green soups. Add a crunch with toasted pine nuts, pecans or pumpkin seeds. Have fun experimenting in the kitchen as more local Spring produce becomes available. Please let me know your favorite recipes using greens. Ready to lighten up this spring, drop excess weight, relieve your joint pain, sleep better and have more energy? Join us for the upcoming Reset and Renew Online Group Program starting April 4.
one can organic coconut milk. Make your own coconut milk by blending two cups water with one tablespoon organic coconut butter! Roast a butternut squash. Treat it like two separate vegetables when preparing to roast. Cut off the bulb of the vegetable, and scoop out the flesh and seeds. Halve the other, oblong part of the squash. Roast flesh facing down in a half inch of water, for one hour at 375 degrees, or until you can easily pierce the squash. Let cool, scoop out the flesh from the skin and set aside. Heat butter or ghee and sautee the leeks for 5-7 minutes in a soup pot. Add nutmeg, then butternut squash and broth. Cook for 10 more minutes. Either use an immersion blender to puree or transfer to a blender or food processor and blend until smooth. Add the coconut milk and salt and pepper to taste, and blend again. I'm often asked about Golden Milk, a traditional Ayurvedic remedy. It's a nourishing, warming drink to help promote a good night's sleep. Eating a meal is not something to “get over with”. Instead, choose to savor your food. Are you a slow, fast, or moderate eater? For many of us, (myself included!) eating quickly can be one of the hardest habits to change. Food is a part of the environment OUTSIDE our body. When we take food into our body (ie, EAT) it goes through the process of digestion, absorption and assimilation, and becomes our skin, muscles, our brain and organs! Eating isn't something to get over with in order to move onto the next thing! It IS the thing. The process of eating, digestion, absorption and assimilation is incredible. Plants, or animals that ate plants, transform to become our body, an amazingly intimate process. This understanding has helped me to consciously choose to eat “real” food, and skip “food-like” substances which ask the body to digest what doesn't exist in nature. Recently, this perspective turned on a light bulb with one of my clients, and helped him slow down the rushed eating patterns in his life. There are two states in which we live, number one, in stress response (sympathetic dominance), and number two, in the relaxation response (parasympathetic dominance). It's not possible to exist in both states simultaneously. When driving, walking, scrolling online, or even thinking about a stressful situation, our body is not relaxed, and cannot optimally digest, absorb and assimilate the food we’re eating. We can improve HOW we eat by mindfully establishing the relaxation response when eating. Recently, a friend and I were reviewing the proofs of her new book at an outdoor cafe. When the soup arrived, pages were spread around, so we moved the bowls to the side. For the next five minutes, without eating, we enjoyed the beautiful orange tomato soup drizzled with green basil oil and the aroma. It was a wonderful practice of savoring the food and moving into relaxation response, which prepares the body to optimally digest, absorb and assimilate a meal. Digestion starts in the brain. Our digestive juices and enzymes begin to flow before anything ever enters our mouth, so preparing a meal ourselves actually helps with digestion. If you ever feel hungry not long after eating, it could be because your awareness wasn’t on the food, and your body literally didn't get the message that it had eaten. If feeling extremely hungry causes you to eat quickly, first drink a glass of room temperature (not cold or iced) water. Drinking 10-15 minutes before you eat is optimal. Hunger is often disguised as thirst, and drinking water is one strategy to help you slow down. Take at least three deep breaths before eating. Commit to sitting down and focusing on eating without any distractions. Look at the food and smell the aroma. Recognize, with gratitude, all the steps involved for the food to arrive on your plate, especially if you did not prepare it yourself. Set a timer. Whether for 15 minutes or up to 30, extend the period of the meal. It’s a process, and taking more time to eat will yield benefits including better digestion, which can improve your overall health and well being. Remember, it's NOT what we do occasionally that matters as much as what we do most of the time that affects our health and well being. The Reset and Renew online program is Three Weeks of Nourishing Self Care to Learn to Live Better in Your Body. My relocation to the West Coast did not begin as planned. Instead, literally starting off on the wrong foot, less than ten minutes after getting off the plane and while still in the airport, I fractured the fifth metatarsal of my right foot. It’s been a long, two months plus of recovery, but I’m happy to say I’m walking on both feet once again, free of a cast, boot and crutches!